i’ve been saying it for years. when we get old, old folks homes will be just another version of the hippie commune, and institutionalized old folks homes will be like prisons. Stan and Peggy Northup-Dawson in the courtyard of Glacier Circle, communal housing in Davis, Calif., that they developed with 10 friends. 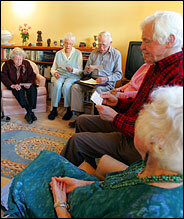 Some of the residents of the Glacier Circle complex gathered last week for a meeting at the home of Dorie Datel. Clockwise from left, Lois Grau, Mary Ellen and Ray Coppock, Ms. Datel (obscured), and Stan and Peggy Northup-Dawson. DAVIS, Calif., Feb. 23 — They are unlikely revolutionaries. Bearing walkers and canes, a veritable Merck Manual of ailments among them, the 12 old friends — average age 80 — looked as though they should have been sitting down to a game of Scrabble, not pioneering a new kind of commune. Opting for old age on their own terms, they were starting a new chapter in their lives as residents of Glacier Circle, the country’s first self-planned housing development for the elderly — a community they had conceived and designed themselves, right down to its purple gutters. Over the past five years, the residents of Glacier Circle have found and bought land together, hired an architect together, ironed out insurance together, lobbied for a zoning change together and existentially probed togetherness together. The four couples, two widows and two who are now living solo live in eight individual town houses, grouped around an inner courtyard. Still under construction is the “common house” with a living room and a large kitchen and dining room for communal dinners; upstairs is a studio apartment they will rent at below market value to a skilled nurse who will provide additional care. It is their own self-styled, potluck utopia. “It’s an acknowledgment that intimacy doesn’t happen by chance,” said John Jungerman, 84, a retired nuclear physicist and one of several Ph.D.’s in the group, who is perpetually clad in purple socks and sandals. There are about a dozen co-operative housing developments for the elderly in development, from Santa Fe, N.M., to St. Petersburg, Fla., a fledgling movement to communally address “the challenge of aging non-institutionally,” said Charles Durett, an architect in Nevada City, Calif., who imported the concept he named co-housing — people buying homes in a community they plan and run together — from Denmark in the late 1960’s. Though communal housing for the elderly is new, intergenerational communities have been around since 1991, when the first opened in this politically progressive university town. There are now 82 across the country. In Abingdon, Va., residents are beginning to move into ElderSpirit, a development founded by a 76-year-old former nun, Dene Peterson. The community of 37, 10 years in the making, includes a “spirit house” for ecumenical prayer and meditation. “I just thought there had to be a better way for older people to live,” said Ms. Peterson, who formed a nonprofit development corporation with three other former Glenmary sisters, a Catholic order, and knit together a variety of private and governmental funds (16 of the 29 units are subsidized affordable housing). Ms. Peterson says she was haunted and inspired by her work with elderly public housing residents in Chicago in the 1960’s. With millions of baby boomers moving toward retirement, gerontologists and developers are looking to communal housing for the elderly with growing interest, building on a generation’s mythology that already includes communes and college dormitories. Rich Morrison, 79, a retired psychologist from Sacramento State University and the sole single man at Glacier Circle, only recently gave up his hobby, swimming the major rapids of the Colorado River. “Emotionally, there’s no reason why I can’t continue to grow until I’m 100, if I’m lucky,” he said. Mr. Morrison is once widowed and twice divorced. Like others in the group who have struggled through every loss, from a child’s suicide to the death of a spouse, he speaks about now being able to make “heart choices,” hard won. Mrs. Grau and her friends have known each other for nearly 40 years, raising children in the same neighborhood. Many residents met through the local Unitarian Universalist Church, and they still begin weekly meetings by pledging to “listen deeply and thoughtfully” to each other. Davis is known for its involved citizenry who dash off to their book groups at 7 p.m. The Glacier Circle 12 even partake of what they call a “dream group,” in which they discuss their dreams. Their talents and resources are by no means typical. They are all accomplished professionals, and the market value of their homes allowed them to purchase land and build their dream at a cost of $3.2 million, or about $400,000 each, plus $350 a month in dues. They expect to collect $850 a month in rental income. Individuals own their own homes but share expenses of common areas. Stan Dawson, 75, a resident who has a doctorate from the Harvard School of Public Health, retired as chief of air pollution standards for the State of California to navigate the project full time through bureaucratic hurdles. The design-by-democracy may not work for everyone. To be sure, the challenges are daunting. Sue Saum, 74, for instance, moved in with her husband Jim, 84, a retired professor who, during the course of planning the community, was told he had Alzheimer’s disease. Shortly thereafter, Mrs. Saum was operated on for breast cancer, and recently she had back surgery. At some point, she acknowledges, her husband may need care beyond their friends’ abilities. Six more ElderSpirit communities, in St. Petersburg, Fla., Wichita, Kan., and elsewhere, are in planning stages, with some financing from the Chicago-based Retirement Research Foundation. Not surprisingly, a streamlined form of community housing may be in the wind, as efforts spring up around the country to speed up the planning process, which normally takes two and a half to three and a half years. Unlike intergenerational co-operative housing, a niche market of about 5,000 people, communal housing for the elderly has “far more market potential,” said Jim Leach, president of the Wonderland Hill Development Company in Denver, which is building Silver Sage, a communal housing development for the elderly scheduled to open in Boulder next year. Dr. William Thomas, who developed the “Eden Alternative,” a widely publicized effort to make nursing homes less institutional, is developing Eldershire in Sherburne, N.Y., south of Syracuse, a hybrid between co-operative housing and a traditional development. The idea is to build first and then attract residents who will run it themselves. Even revolutionaries need to be flexible. At Glacier Circle, where the first tulips of spring are popping up, the group had approved special wall insulation for Mr. Morrison, who has a penchant for playing Mahler’s Ninth Symphony at 3 a.m. When the bass and timpani pulse through his subwoofer, his neighbor Dorie Datel, a youthful 80-year-old, just lets it slide. For Ms. Datel, whose husband left her for “the other woman” he met at Elderhostel, this group’s wisdom and resolve are embedded in the square footage. 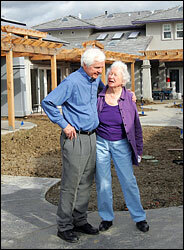 Glacier Circle and ElderSpirit are self-developed cohousing communities. The Elder Cohousing Network, founded four years ago, offers for-profit how-to workshops. General information is available through a national non-profit, www.cohousing.org. Posted on June 6, 2011, in research. Bookmark the permalink. Leave a comment.